Rafael Nadal celebrated his 27th birthday on Monday with his 56th win in 57 matches at Roland Garros. The third seed and seven-time champion moved up through the gears in beating No. 13 seed Kei Nishikori 6-4, 6-1, 6-3 for a place in the quarter-finals, where he will challenge seventh seed Richard Gasquet or No. 9 seed Stanislas Wawrinka. Nadal, who worked on his game off-site Sunday when the practice courts were full of junior starlets, appeared to be tentative in the early stages of the first set. Although he struggled to strike his forehand cleanly, he was driving through his backhand with purpose. 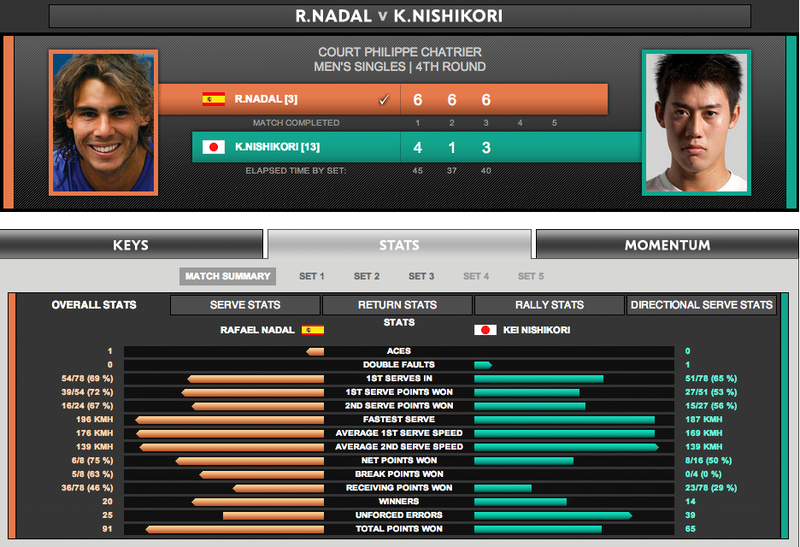 Nadal did enough to break Nishikori for a 3-2 lead and maintained the advantage to clinch the 45-minute opener. Nishikori, returning serve from deep behind the baseline, showed flashes of brilliance – particularly off his backhand wing – to stay competitive in a tight first set. Nadal held off break points early in the first set and did so again in the second set. On return of serve he targeted Nishikori’s backhand and reaped the rewards. A break of serve in the third game, courtesy of a well-placed lob, gave Nadal confidence. When he won three points in a row at 3-1, Nishikori’s back was firmly against the wall. Nadal broke for a third time with a crosscourt backhand winner to clinch the set in 37 minutes. He continued to neutralise Nishikori’s game in the third set, despite finding himself at 0/30 at 1-1. As the wind grew in strength on Philippe Chatrier mid-set, it weakened Nishikori’s serve. Nadal opened up a 4-1 lead and Nishikori’s frustration grew. The first Japanese man to reach the fourth round since 1938, failed to convert any of his four break point opportunities in their fifth FedEx ATP Head2Head meeting. At the end, the Court Philippe Chatrier crowd sang “Happy Birthday” to Nadal, who remains on course to become the first man in tennis history to win eight titles at the same major championship. Nishikori, 23, had been attempting to become the first Japanese may to reach the Roland Garros quarter-finals since Jiro Satoh did so in 1931 and 1933.